One of the most interesting Visible Thinking Routines I’ve used is called “one word.” It asks of students the distillation of a presented image or text into a single word. The ultimate summary. 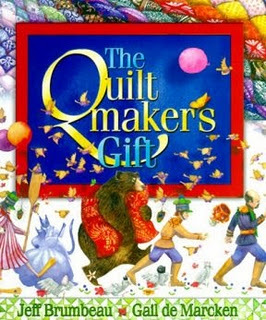 This week the third graders were challenged to do this after I read Jeff Brambeau’s beautiful book, The Quiltmaker’s Gift. Beautifully illustrated by Gail de Marken, it tells the story of a very rich and greedy king who, though in possession of every gift he could possibly want, could not smile. Thinking the one last gift he could get was a beautiful quilt made by a mysterious old woman in the mountains, he sets out to get one even though she has told him she only gives to the poor and needy. Through a series of transformative tasks, the king discovers how to be happy at last. Without giving away the lovely and detailed story, students came up with several single words: generosity, giving, unselfishness, and caring, to name a few. This was a great way to start off the new year! Kindergarten–Oh, that odd bird! There’s not another one like Tacky, the Penguin in Helen Lester’s book of the same name. There were lots of giggles as Tacky showed just how different he was, but in the end, it was his difference that saved the day. We did a Visible Thinking Routine called Same, Same, Different to compare Tacky with his companions and talked about seeing the value in individual differences. First Grade–After comparing fiction and non-fiction books with a Visible Thinking Routine, first graders heard Stranger in the Woods by Carl R. Sams II and Jean Stoick. This book was a little tricky to categorize at first because instead of illustrations there were photographs (hints that it might be non-fiction), but as students soon found out, this was a charming story about two children who build a snowman just for the forest animals and watch as the animals discover (and eat) their creation. Fourth Grade–Trying to predict the plot in Mrs. Marlowe’s Mice, a fabulous book written and illustrated by Frank and Devin Asch, is a tricky proposition. Fourth graders loved the twists and turns in the plot and were riveted to the pages when it almost appears the the main character has been tricking us all along. This is a great way to teach the literary device of foreshadowing and to use the Visible Thinking Routines called Plot Prediction and Writer’s Craft Detective. Fifth Grade–Fifth graders in Mr. Orr’s class played a great game of Library Jeopardy. This entry was posted in Uncategorized and tagged carl r sams, greedy king, jean stoick, non fiction books, stranger in the woods, tacky the penguin. Can you explain the visual thinking technique you used with Tacky the Penguin? Thank you! The routine I used is called “Same, Same, Different” and it gives the students a routine or framework in which to compare and contrast two things. We are encouraging students to use the “language of thinking” and so I would tell them first that we are doing the routine and remind them that they start their response by saying “I think Tacky is the same as the other penguins because…..” Other students can comment by saying “I agree with (the original student) because….” Or, they can say, “I disagree with (the original student) because….” Then I would prompt them as the story went on to look for all the ways Tacky was different (his clothes, his speech, etc.) and again they use the language of thinking to express their comments. If a child just says, “They’re different” my prompt is always, “And what makes you say that?’ What we look for is verbalization of details and ideas that back up their statements. And because this is a verbal discussion, the other students can “see” how others are formulating thoughts. We are using this program throughout our school and it’s really exciting. You can adapt the routines to so many different lessons and in my case, to so many different books at different levels.